How’s this for a coincidence? Both the Kentucky Oaks and Kentucky Derby winning trainers omni-ed (finished first and third) in their races, Larry Jones with Lovely Maria and I’m a Chatterbox on Friday, Bob Baffert with American Pharoah and Dortmund on Saturday. And what a story it would have been had 52-year-old jockey Gary Stevens, second in the Derby with Firing Line, been Oaks-winning 56-year-old rider Kerwin Clark’s counterpart. Sometimes the angle on both classics is upset and surprise; this year it was about being at the top of your game. Form held, in that the Kentucky Oaks winner, yet again, passed through the Fair Grounds. And in that the Kentucky Derby winner was the post-time favorite for the third year running. The Oaks win was the third for Jones since 2008, all with fillies owned by Brereton Jones. The Derby win was the fourth for Baffert, and for an owner, Ahmed Zayat, with a string of near-misses, including one in 2009 with the sire of this year’s winner. For Clark, the Oaks winner was his first Grade 1-winning mount, and the rider was the third to get his first Grade 1 win on one of Jones’ Oaks fillies. For Victor Espinoza, the Derby winner was his third, his second in two years. Talent enough to win the Triple Crown? We’ll find out over the next five weeks. Baffert said the plan is — of course — to continue on to the Preakness. His stablemate will do the same. “If Dortmund turns the tables on [American Pharoah], so be it,” the trainer told Jonathan Lintner of the Courier-Journal. American Pharoah was given a Beyer speed figure of 105 for the Kentucky Derby, the same figure he earned winning his final prep, the Arkansas Derby. TimeformUS awarded him 127 (post updated to included this link 5/7/15). Looking at the chart, it’s striking how consistent the top three finishers were through the first six furlongs. It’s a very even race. Dortmund (the leader, as predicted by the TimeformUS pace projector) took the field through a moderate first quarter in :23.24, a half in :47.34, and the first three-quarters in 1:11.29, and what had been a tight group near the front the first time past the grandstand separated into the three front-runners and the rest by the final turn. For a nice illustration of how the race unfolded, compare the official chart (PDF) points of call with the Blood-Horse pictorial race sequence. 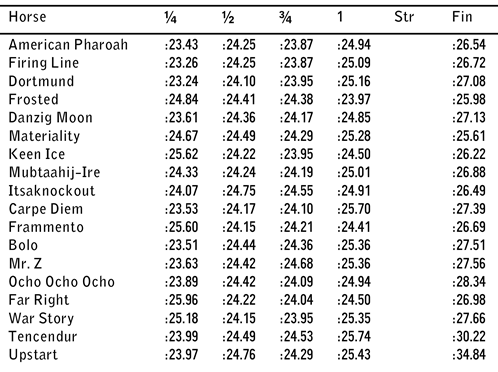 The final time for the Derby was 2:03.02, and American Pharoah’s margin at the wire one length over Firing Line. Espinoza had to go to work on him with hands and whip (something Larry Collmus picked up in his call, noting Pharoah was “under a ride”), and he responded. It wasn’t a brilliant victory, but a solid win, the kind that reveals a horse’s mettle. Pharoah is tough. For that matter, so is Firing Line, who I unfairly and wrongly (so wrongly) discounted when handicapping. The Sunland Derby winner had finished second to Dortmund in their two earlier meetings, and the pair went to the front together in the Kentucky Derby, keeping both busy. “I not only have to turn the tables on Dortmund with Firing Line, but I’ve got to figure out a way to beat American Pharaoh,” Stevens said during a Reddit AMA two weeks ago, talking about his Derby strategy. “I’ve already figured out a way to beat Dortmund! For my plan to work, I’ve got to be in the right place at the right time.” Credit the rider with pulling off at least half his plan — Firing Line headed Dortmund turning into the final quarter and finished two lengths ahead of the previously undefeated colt. If Firing Line did anything wrong, it was that he didn’t switch leads in the stretch (via @randy_moss_TV). No excuse for Dortmund — he just didn’t have that last furlong in him. Frosted ranged up late and almost got him for show. “He’s a really good horse and he ran like it today,” said jockey Martin Garcia after the Derby. “He always comes to run; that’s the kind of horse he is. He got beat today by really good horses. That can happen.” The question going forward is, did he reveal a distance limitation, or — with the experience — will he be able to handle 10 furlongs in races such as the Travers or Breeders’ Cup Classic? Her victory is lovely, for so many reasons. Mike Welsch’s observations on the 2015 Kentucky Derby field are now up on DRF (subscription only). I’m on the Dortmund bandwagon, and so was pleased to read the noted works-watcher’s comments on the Big Brown colt: “[H]e really seems to be flourishing since his arrival in Kentucky.” Fantastic. After finishing second to Dortmund in the Los Alamitos Futurity last December and then the Robert B. Lewis in February, Firing Line came back to win the Sunland Derby on Sunday by 14 1/4 lengths, a performance that earned him a Beyer speed figure of 97 and a TimeformUS figure of 111. With the final round of Kentucky Derby preps beginning on March 28, each worth 100 points to the winner, here are the 2015 prep schedule results so far. American Pharoah is a brilliant horse. Dortmund is a grinder. He’s tough and game and somehow he always has his nose in front at the wire, but nothing he does takes your breath away. I’d be shocked if he proves to be the better of the two Baffert-trained stars. I don’t know — a grinder who can make a horse capable of a 14 1/4 length win work hard for second, not once, but twice, is kind of brilliant in his way.